DragonVale is a simulation video game created by Backflip Studios for the iOS platform. It can be downloaded for free from the Apple App Store and played on the iPod Touch, iPhone and iPad. Comment: DragonVale is a game about raising and collecting a huge number of different types of dragons, and in that it succeeds. Where you like your dragons cute and cuddly or large and ferocious, DragonVale has something to offer. Comment: It's pretty simple game, but I don't like these kinds of games. I like to play those games for a few hours only, but after that I don't even remmember the game. I rate it 5/10 becouse it's somewheat booring. Comment: Your task in Dragonvale is to build settlements for dragons, and then make the tourists come. To increase your income, you must give your food dragons and get the dragons to breed. The more dragons you get the more settlements you need and so on. At first, you only have a single island to take care of, but eventually you get the opportunity to gain more islands. To make room for all buildings, decorations and roads need to clear away boulders and trees first. 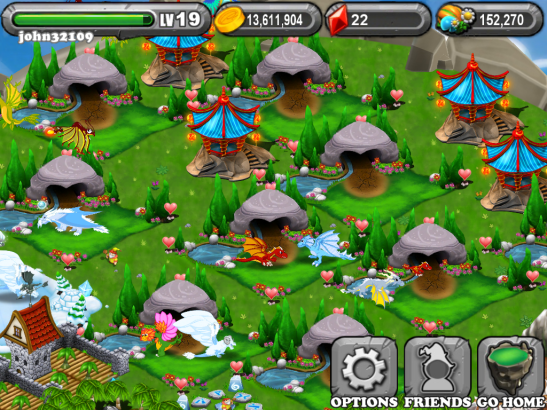 Dragonvale can be pretty addictive once you started to play it. The game can be fun to play when you are bored.